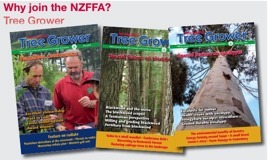 NZ Farm Forestry - United Forestry Group - Is this a better deal for small-scale forest owners when they harvest? Julian Bateson, New Zealand Tree Grower November 2014. The United Forestry Group was launched as a new company on 21 August. 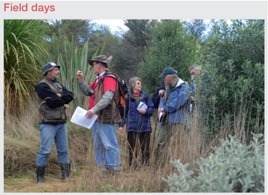 I was invited to the press briefing and the company launch in Wellington and had the opportunity to see what was on offer for the small-scale forester. Why should small-scale foresters need another company when there are contractors out there keen to harvest your trees? A logging gang needs about 100 hectares to be kept busy for a full year. This means that contractors working in small-scale forests seldom have certainty of work for more than a few months ahead. For this reason they will charge a small-scale forest owner more per tonne of logs to harvest than they would for a larger forest. When there is a log price downturn this often means that it is not worth harvesting small woodlots as the cost of harvesting can be greater than the income from the trees. In recent years, low log prices in September 2007, November 2011 and June 2014 meant that many small-scale harvesting operations had to stop because the forest owner’s cost of harvesting and transporting wood to the market exceeded the income. Intermittent work of unknown duration means it is difficult or impossible for contractors to train skilled workers and retain them. In addition, there is less likely to be money available to invest in more productive and safe machinery. In contrast, owners of larger forests have lower cost structures. Because they have greater forest areas at their disposal, they can offer continuous work and can afford to weather the price reductions without dismissing contractors. These owners catch the crests and the troughs of the log price waves. This ensures that over long periods of time they get average prices, along with a premium from being able to guarantee continuity of wood supply to local mills. The aim of United Forest Group is to give owners of smaller forests access to big forest benefits by being able to aggregate small-scale forest harvesting. A number of methods have been suggested in the past, such as cooperatives, to help small-scale foresters work together at log harvest and benefit from this aggregation. What sets New Zealand apart from some other countries in this respect is the age of our forests. If they are harvested in an uncontrolled way they will generate local walls of wood. To transform a local increase into a something which approximates a sustainable yield, members of a forestry cooperative would have to relinquish control of the decision about when their individual forests are cut. The new company has been formed by investors from Superpen, a joint venture between Pentarch of Australia and Xiangyu Group from China. The New Zealand chairman is Geoff Thompson, who is also the chairman of the Forest Growers Levy Trust Other directors are Malcolm McComb chairman of the Pentarch Group of companies, Li Xiongwen the Director of Investment and Management for Xiangyu Group Corporation, and New Zealand forestry identities, Kelly Coghlan and Hamish Levack. United Forestry Group aim to buy forests now or later, offering a combination of money and company shares. They have about seven different options such as the simplest − buying the timber outright − or various deals including management, harvesting, shares and cash. The aim is to harvest and produce a regular supply of timber in the way that the larger corporates do, and let the owners of the trees benefit from better prices as a result of long term supply contracts. This means that when the price oscillates up and down, the small woodlot owners do not have to second guess the market for the best prices. Owners may do that on their own, that is to get the top price, but they are the lucky ones. The unlucky ones get the lowest price or nothing at all. The aim is to smooth all this out so that the price the owner gets should be a good average. Hopefully it will also flatten the predicted peak in harvesting from small- scale forestry. The only aspect which the owner will not control is the exact timing of the harvest which will be to suit the harvesting operation. One significant benefit would be long term contracts for logging contractors and processors, which should allow them to invest in modern safer equipment for safer forestry. Harvesting contractors currently operating will be given the opportunity to carry out the work, depending on the contract price. So there would not be any real difference in what the owner may see but the contractors would have the benefits of longer logging contracts. There would be more advance planning for the harvesting operations, which would benefit everyone involved and mean that workers would also have more continuity of employment. Local mills should also benefit from more sustainable supply of logs from the smaller forests. For the forest owner if the price of logs suddenly fell, logging would not stop. If prices suddenly rose the planned harvesting would still go ahead. The problem with sudden price rises is often that woodlot owners all try to get their logs harvested at the same time and there can be a lack of reputable harvesting contractors available. Overall, using the system offered by United Forestry Group should mean safer harvesting, more managed prices and more predictable income from log sales. It should also mean that less accessible woodlots could now be worth harvesting. Often the costs of extraction from sites well away from mills and ports means that the grower would get little or no return from the harvested trees. Many farm foresters planted their trees in sites with little or no road access and perhaps at some distance from the nearest mill or port. As we all know there is an expected bulge in small-scale forestry harvesting in the next decade. Around 40 per cent of New Zealand’s timber harvest will come from trees planted by farm foresters and other small-scale forestry owners. It is up to owners to decide how they plan for their tree harvest. The NZFFA has no formal links with this new company which is out there to compete on its own with everyone else. The price of logs will no doubt continue to fluctuate in the years to come. Harvesting your woodlot needs to be well planned and if you have already carried out a harvest you will know that planning ahead is vital. United Forestry Group offers a new opportunity not previously available. It seems to be a worthwhile option to consider when planning your next harvest. However it is up to you to decide.